Favourites can be used to provide quick access to publications you frequently use. The list of Favourites is fairly basic in implementation. 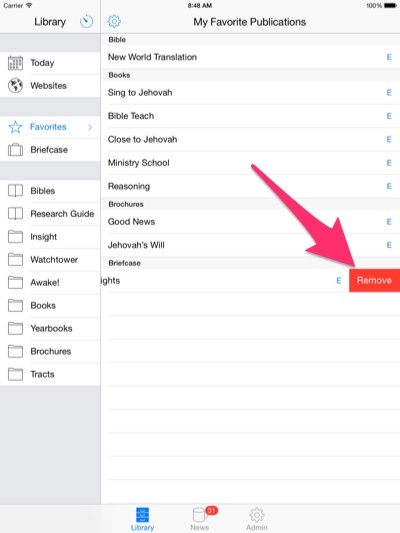 The publications you add can be re-ordered and grouped by type. How do I Add a publication to Favourites? Open the publication window. So for example open Books > Bible Teach. Click the action button at the top of the Contents panel "..."
How do I Delete a Favourite? Can I save my NWT Bible as a Favourite? Good question. Yes you can. In fact for English users the NWT 2013 Revision should already be a Favourite. The secret to adding a Bible as a Favourite is first of all working out how to locate and access the NWT Bible Publication. The NWT Bible Publication is the pages from the Bible that are not the Books/Chapters - i.e. the Publishers page, Questions, Book Outlines (for the 2013 Revision), Foreword and Appendices. 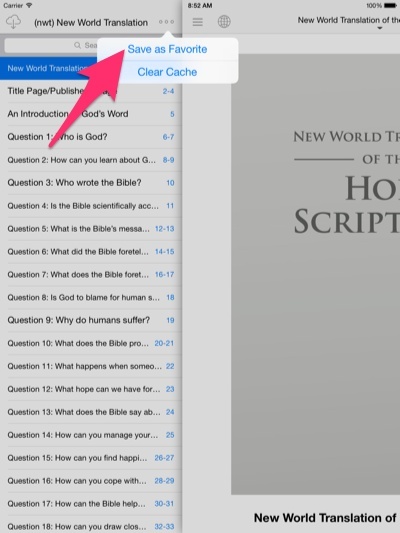 You can open the Bible Publication from the Bible window. 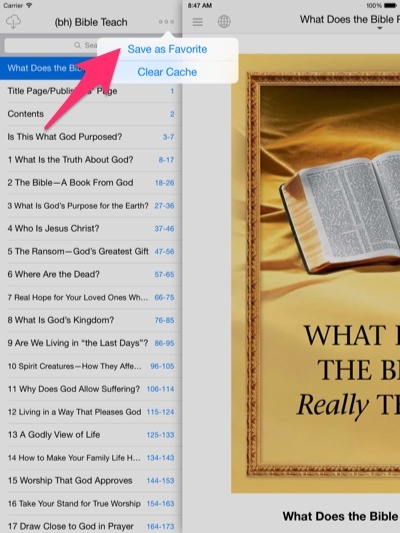 The exact location will depend on if you are using Single Language mode, or multiple Bible's side-by-side - but look for the button with an "Open Book" icon. 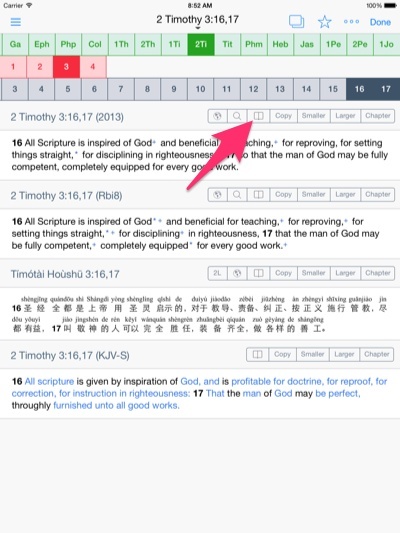 It will on the top toolbar if in Single Language mode, or above the blocks of verses if you have multiple Bible's open. Click this to open the Bible Publication - and then "Save as Favourite" by following the instructions above. See the screenshots at the end of this page for an example.